Called “ronin mawashi” in Japan, where it is popular among the pre-collegiate community, pen twirling has its stars, as does any other performance or skill. Accomplished masters of the art form that are well-known — at least among those who follow the sport — have developed a reputation for creation of certain signature ‘moves’. David Weis is credited with creating numerous ‘back’ style moves, such as the “BackAround”. Hideaki Kondoh is generally credited with giving the pen trick “Sonic” its name, because of the way the pen would blur in his fingers. Pen spinning only recently saw a rapid increase in recognition due to the emergence of internet media websites such as YouTube. From 2006 onwards, the art of Pen spinning has developed subcultures in many countries of the world including the Asiatic-regions and Europe (France, Germany and Poland). I wonder if I feel the same way that teachers must have felt about rubics cubes or hackysacks when they came on the scene. This feeling of, “what’s going on around me? When did this start? And Why didn’t I get the memo?” In the past, when something like this occurs, I normally become somewhat efficient in the activity so I can join in the conversation. I’ve gotten a lot of play out of my own World of Warcraft obsession, after all. But in this case, my fingers just can’t do the darn tricks. My dad has always said he can’t press the little buttons on the iPhone because of his Eastern European immigrant fingers. I’ll chalk it up to that with my inability to do the pen spinning thing too. But even though I can’t do it, at least I can learn about it. And I can touch base with those kids who I may not have reached yet, and when I ask them to put it away (“If you’re spinning your mods, you clearly don’t have pen to paper”) I get more smiles and buy-in because the kids know I’m not after them personally. I hear of teachers practically having conniption fits when the propelling blurs begin. But I’m pretty calm about it, I mean, I have to ask the bigger questions when the whirring begins: The students claim that they are merely thinking, but really are they bored? Are more of them kinesthetic learners than I thought and this is a true visual indication of just how many students are antsy in their seats each day? Are they desirous of a shop class back on the schedule, something that is about creating, supping up, in this case, pimping their pen? Or are they just struggling to find individuality in a standardized prison, actually showing their own desire for differentiation by modifying anything that they can get their hands on? It’s also kinda a boy thing, right? And we’re all looking to reach out to those tween boys. Girls have been showing their individuality for a while now: stickers on binders when they are younger, magazine collages inserted into the binder plastic by middle school. But this pen craze seems more like a boy-centric version of the same thing, the need for attention, the need to create their own machine, the need to show off the variables that they changed to accomplish something better than the other guys sitting next to them. So when I see a tween obsession, my most important question is How can I harness it? 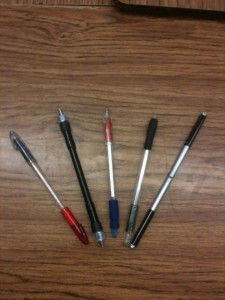 Do I have them do a step-by-step assignment on How to modify your pen for ultimate spinning possibilities? So I have them write a guide with links to pages for further resources? Students will find ways to differentiate themselves. While we all know that tweens desire to be part of a group, they also desire individuality, and the knowledge that they are being evaluated as individuals. So whether it’s whole group or small group work, I need to make sure there are outlets and evaluations for the individuals as well. And even when I have the students working alone, I ask myself how I can allow them the opportunities to tweak their own learning to make it applicable for themselves. So many teachers are intimidated at the thought of individualizing the curriculum for each student, but maybe the students need to take ownership of that job; let’s call it curriculum modification rather than differentiation, and then it is really up to us, the teachers, to give students the opportunities to modify for themselves. Back to pen spinning: what do you think, dear reader? I don’t want to fight something that should be exploited. How do we tap into a current obsession and make it something applicable in the classroom? chatbot advertising - chatbot advertising Learn the best chatbots agency technology now available additionally on megasale now! python ai chatbot - python ai chatbot Find the new technology chatbots marketing technology now available on megasale now! chatbot development company - chatbot development company Find the best chatbot agency platform now available reasonably priced now! business marketing - business marketing Get started now from the most professional online business marketing that are available and reasonably priced today! Omaha SEO - Omaha SEO Get going now with the best marketing firm that will be available and an awesome value today! business marketing - business marketing Get started now from the best rated search ranking agency now available in addition reasonably priced today! seo great falls - seo great falls Find here professional seo agency that is available and also for a great ROI today!